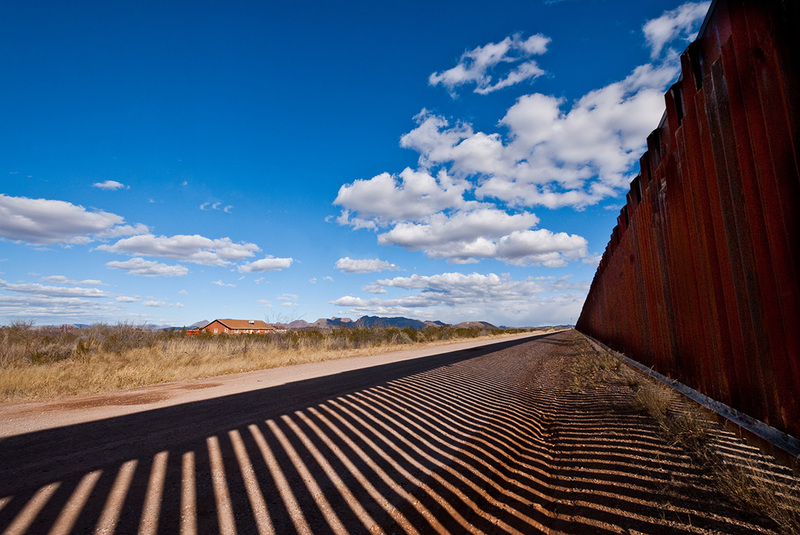 A section of the border wall separates Douglas, Ariz., from their neighbors in Agua Prieta, Sonora, Mexico. Sarah Burt is the lead attorney on the lawsuit challenging the declaration of national emergency. Raul Garcia is a senior legislative counsel and an expert on border issues. Ramirez v. Trump challenges President Trump's declaration of national emergency to build additional miles of the southern border wall. Earthjustice filed the lawsuit in the U.S. District Court for the District of Columbia on Mar. 14, 2019, on behalf of the Ramirez family of San Juan, Texas, who fear that they may lose access to family gravesites or that their loved ones’ bodies may be exhumed to build the wall. Joining the Ramirez family as plaintiffs in the lawsuit are the Carrizo / Comecrudo Nation of Texas, whose ancestors inhabited the Rio Grande Valley for centuries and whose sacred cultural and burial sites would be threatened by new sections of the border wall; Elsa Hull, a landowner on the border; the Rio Grande International Study Center, a nonprofit based in Laredo, Texas, that works to protect the Rio Grande–Rio Bravo watershed; GreenLatinos; and the Labor Council for Latin American Advancement. Earthjustice's Sarah Burt and Raul Garcia explain the issues at the heart of our lawsuit. Sarah Burt, the lead attorney on the lawsuit, and Raul Garcia, senior legislative counsel and an expert on border issues, explain the issues at the heart of our lawsuit. What’s the illegal action being challenged in the Ramirez v. Trump lawsuit? The president has gone beyond his constitutional powers by taking action that tramples on Congress’ power to decide how our tax dollars are spent. The lawsuit argues that the president does not have the power to do this under the Constitution. We have laws, and they all extend from the Constitution. The power to appropriate funds to build a wall belongs to Congress, not the president. Congress has already rejected his plans. The president's action to build the wall using money appropriated for other things — when Congress has explicitly said 'no' — is illegal. What’s at stake with this lawsuit? The president is ordering that the government take people’s land; that it destroy cemeteries where American families buried their ancestors for generations; that it prevent communities from accessing their river and their places of worship. The lawsuit alleges that the wall would have “real and dire impacts for communities living along the border,” including potential exhumation and desecration of border families’ loved ones’ remains at the 154-year-old Eli Jackson Cemetery and the 145-year old Jackson Ranch Church and Cemetery in Texas. We are asking the court to stop all agency actions to implement the unlawful emergency declaration. Read the legal complaint. Could the border wall be built around the properties? It’s unlikely that this would happen, because at least one of the cemeteries is right next to the border. The Ramirez family owns that land and any obstacles to access that land would damage it. If the administration decides to build the wall around the property, it would still restrict access to the property, because the cemetery would be located between the actual border line and the wall. How does this emergency declaration differ from previous declarations? This is the first time that both houses of Congress have voted to disapprove the declaration of emergency. This is the first time that the president has declared an emergency for a situation that is ongoing and not an unexpected turn of events that requires quick action without giving Congress the chance to weigh in and take appropriate action. And, this is the first time that a president has declared an emergency to specifically override the will of Congress, who considered and rejected funding for Trump’s border wall. The reason to give the president extraordinary powers in an emergency is for situations when action needs to be taken quickly, and there isn’t time for Congress to deliberate and act. It is the unexpected and time-sensitive nature of the circumstances that justify avoiding normal legal procedures. But here, there hasn’t been a dramatic change in circumstances. In fact, the number of apprehensions, drug confiscations, etc., at the border have been going down. Data from the U.S. Customs and Border Protection show that from January through August 2018, 88% of cocaine, 90% of heroin, 87% of methamphetamine, and 80% of fentanyl seized by Border Patrol were seized by Field Operations at ports of entry. Drug seizures outside legal points of entry (i.e., in the desert) have significantly decreased in recent years — from 2012 to 2017, total drug seizures outside ports of entry dropped 62%. What happens now that the president has vetoed the resolution from Congress? The declaration stays in effect, and the administration moves forward with planning where and how to build the wall. If a judge rules in our favor in the lawsuit, would that override a Presidential veto? Yes. The president does not get to veto the lawsuit. If a judge ruled that the declaration of emergency is unconstitutional, then it would have to stop. The courts interpret the Constitution. The government complies with the Constitution. And nobody is above the law. What if construction on the border wall begins before the judge makes a ruling? Lawsuits can take time. But if we see any construction about to start on the Ramirez property or the sections of the border where any of the plaintiffs live and work, we're ready to ask the court to issue specific injunctions to stop construction while the lawsuit makes its way through the courts. 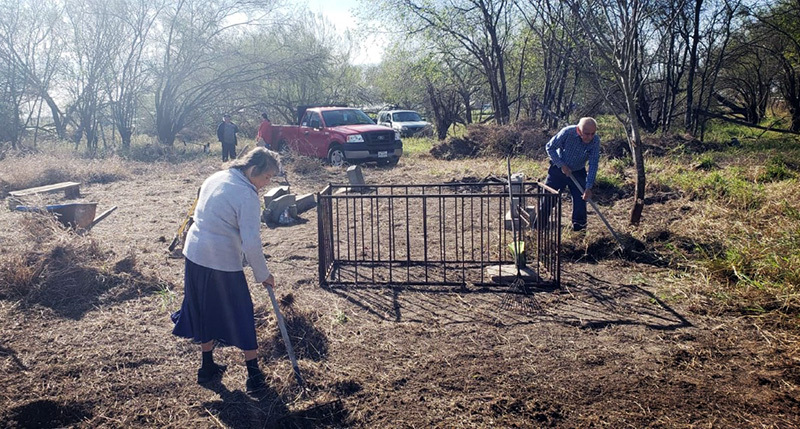 Mr. and Mrs. Paul Villarreal, Sr., tend to the grounds at the Eli Jackson Ranch Church and Cemetery. Mrs. Villarreal is a direct descendant of Eli Jackson. 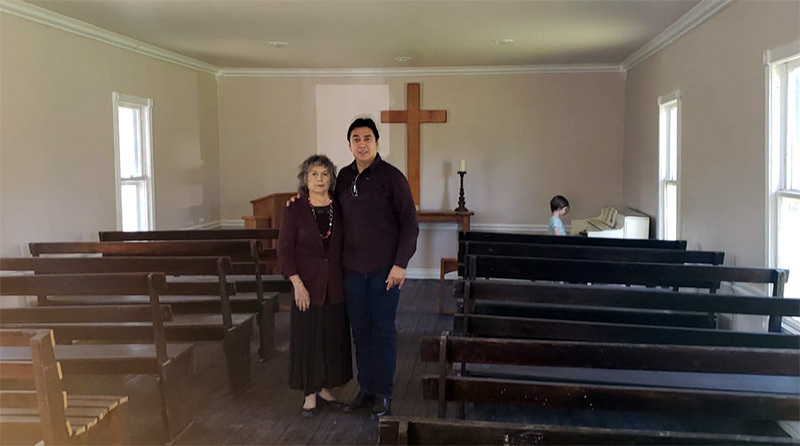 The Eli Jackson Ranch Church and Cemetery in Texas is at risk of being exhumed and desecrated by the Trump administrations’s border wall. Will Congress be able to vote on how agency funds are diverted? No. The whole point of the emergency declaration is to avoid regular legal procedures. Sometimes there are requirements to notify Congress, but Congress won’t get to vote on each decision. Federal agencies will have to make decisions about which government projects to divert money from. For example, the Department of Defense will have to decide which military construction projects to scrap. Will the U.S. Supreme Court get involved? Because this issue gets to the balance of power between Congress and the president, and impacts the civil rights of border communities, the U.S. Supreme Court may get involved at some point. But that is a ways down the road. The case will have to first proceed through the trial courts and the appellate courts. One of the fundamental elements of our legal system is that we have the right to take the government and even the president to court when they violate the law. The president is not above the law. The president is subject to our laws and the Constitution. If he does something that violates those laws, the courts get to step in and undo it. That is justice. Double your investment, all year long. Become a monthly donor before Mar. 31, and your gifts through the first year will be matched $1-for-$1. Because the earth needs a good lawyer. Sarah Burt and Raul Garcia discussed Ramirez v. Trump during a Reddit 'Ask Me Anything' session on Mar. 16, 2019. Sarah Burt is a staff attorney with the International Program. Her interest in international environmental law stems from her experiences living and working with communities in Nepal, Guatemala, and South Africa whose livelihoods and human rights are intricately tied to natural resources and the environment. Raul Garcia is a senior legislative counsel with the Policy & Legislation team. He works with Congress to protect the National Environmental Policy Act, as well as to advance environmental, health, and safety protections in oil and gas development.